We set off on Saturday morning (after some unexpected car troubles) and headed to Porthmadog - the home of the Ffestiniog and Welsh Highland Railways. Parking at the station is limited so we headed to a larger public car park - near Wilko's - not far from the station. 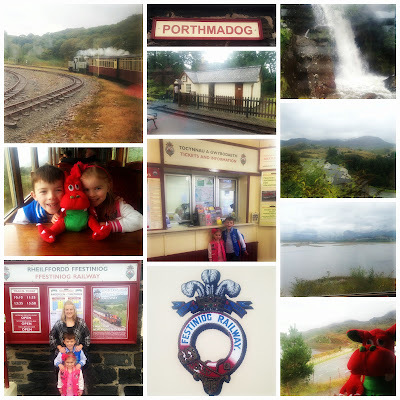 After collecting our tickets we jumped on board the steam train and set off from Porthmadog on the 13.35. The journey took us up through the hills through Minfford and Tan y Bwlch finally arriving at Blaenau Ffestiniog at 14.45. The train has a number of carriages including a couple of first class cabins if you fancy a little luxury on your trip. TOP TIP: There are 2 and 4 seat tables so try and board as early as possible to get some extra space. We started the trip on 2 small 2 seater tables but as quite a few passengers left the train at Tan y Bwlch we were able to sit as a family eventually. The time absolutely flew by and if I'm honest I was surprised how the sights along the journey managed to keep the children entertained for so long. 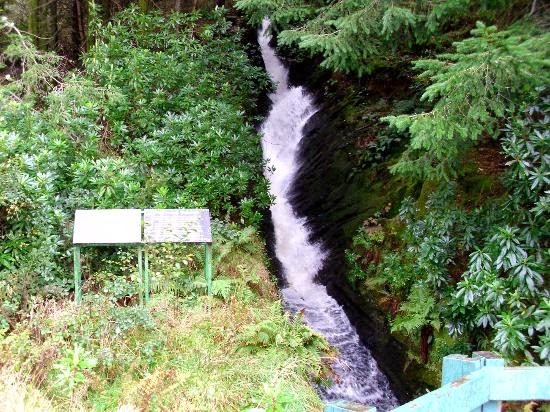 We spotted sheep, waving walkers and please look out for the beautiful waterfall just before you reach Tan y Bwlch - it's stunning! We took a picnic to save on pennies but a refreshment service is available on the train where you can order soft drinks, tea or coffee and even a selection of licenced drinks from spirits through to Welsh cider. After a short stop and a stretch of the legs at Ffestiniog, we boarded the train again ready for the 13½-mile journey back to the harbour of Porthmadog.We all really enjoyed our trip up to the mountains and we would highly recommend it to anyone that wants to take in the sights of Snowdonia in a truly relaxing way. A guidebook is available to purchase on board for £5 where you can find out more about the Ffestiniog Railway. In it you can read about how Ffestiniog and Welsh Highland Railways is the oldest independent railway company in the world - founded by an Act of Parliament in 1832 believe it or not. In fact, the company introduced the world's first narrow gauge steam locomotives in 1863 and four of the original locos still remain! Once back at Porthmadog we took a quick trip to the harbour before heading to the hotel for the evening. 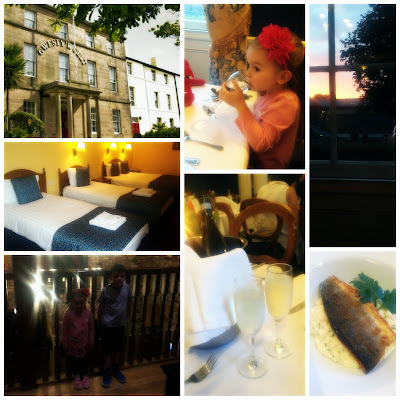 We spent the night in the beautiful Celtic Royal Hotel in Caernarfon, around a 30 minute hour drive from Porthmadog. The food at Brasserie Draco more than made up for it though - was absolutely delicious -and my risotto was the best fish dish Ive had in years! We retired for the night but being all in the same room meant that we were restricted in what time we could go to bed ourselves so we got an early night ready for tomorrow's adventures. We arrived at King Arthur's Labyrinth just before 1pm. We were booked on to the 1.30 trip so we took a wander round the centre. There are lots of little craft shops to explore - a chocolate shop where you can make your own bar, a wooden toy store and a candle shop where you can dip candles. If you book ahead you can even build a piece of rustic furniture! With little time to play with, the children immediately headed to the adventure playground and worked off some energy. We arroved at King Arthur's Labyrinth store a little early so we were shown in to a video area while we waited. At 1.30 sharp, a lady came to take us in to a small seating area where we were told about the adventure ahead. After receiving our hard hats we took the short walk round to the entrance of the cavern. TOP TIP: Wrap up warm and wear wellies if you can as it's very cold and damp inside the mountain. We walked through to the dark passage to be greeted by a mysterious boatman who ushered us on board. We sailed along, through a waterfall (don't worry you won't get that wet!) and disembarked from our boat. 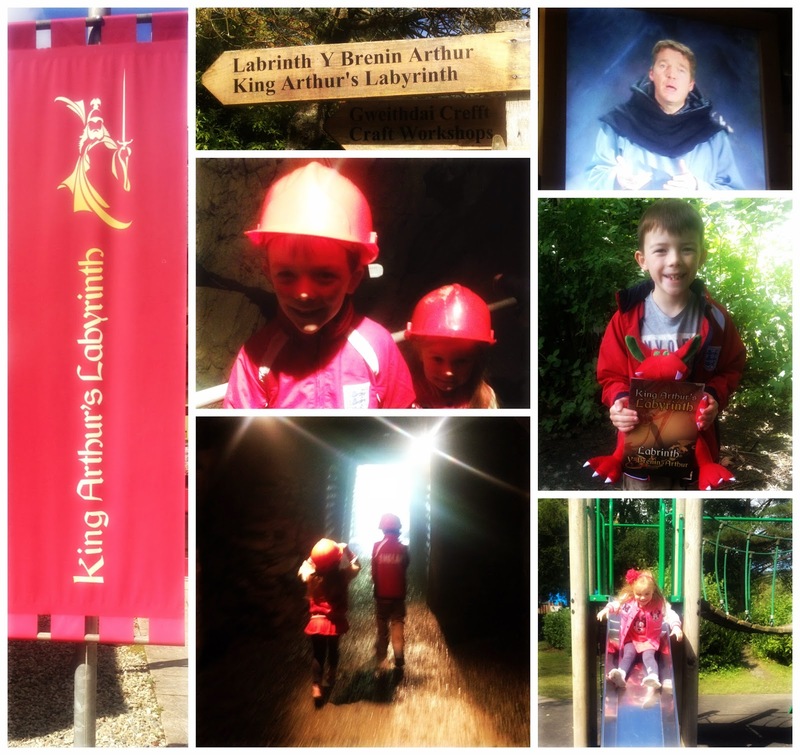 We walked from cave to cave to see and hear the wonderful tales of King Arthur and his men including King Arthur’s final battle - the Battle of Camlan. It was really interesting and we loved walking through the tunnels. There is lots more to do on the site including an another attraction - Lost Legends of The Stone Circle where you can follow the snaking paths and navigate the maze to find mythical stories and The Stone Circle but we had to move quickly to reach our next destination so we ate our packed lunch and headed on. The journey from the Labyrinth to Llechwedd took around 50 minutes. When we arrived on site there were 3 people flying overhead across the Quarry on the 'longest zip line course in the World' - it looked fantastic. The children are too young for that yet so Chris and I have talked about returning next Summer with Grandparents in tow so that we can have a go too! Anyway, I digress, we were there to visit the slate caverns. 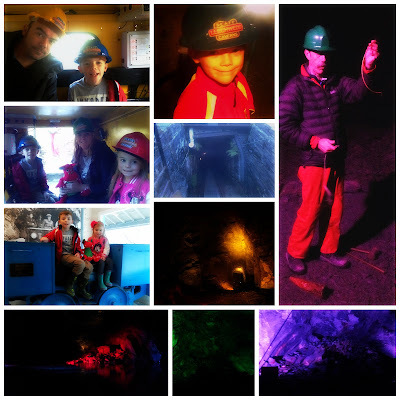 After getting our tickets we walked to the mine area and, for the second time that day, donned our hard hats. 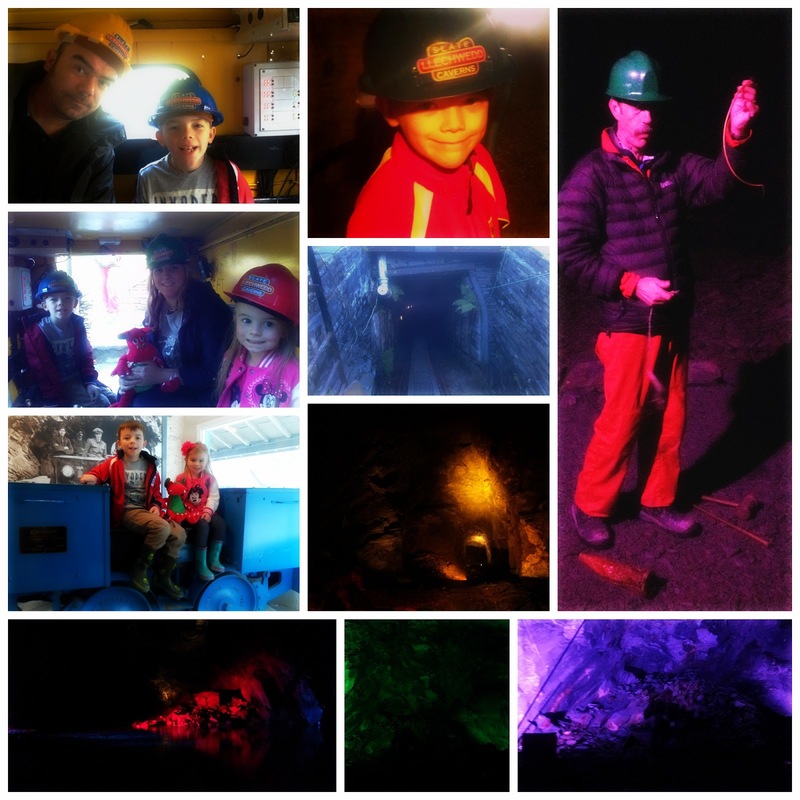 We took a ride down to the mine on the steepest cable railway in Britain taking us hundreds of feet underground. Our guide was fantastic, he told us about how the miners and their families lived during Victorian times. As you walk the half mile journey through the caverns you hear the voice of Sion Dolgarregddu - a young miner that went to work in the mine at just 12 years old. It was unbelievable to think how they must have worked the mines in such dark and dangerous conditions. The caverns were lit beautifully. Part of the tour sees you head down around 60 steps and as we moved through the lower caverns we came to a beautiful, natural underground lake - it was absolutely stunning. As we reached the end of the walk through, our guide gave us a demonstration of how the Victorian miners used their tools. We made our ascent up a further staircase and then back up top in the cable car. We finished the tour with a visit to the Mill where we were shown the ancient skill of slate splitting - Little E and Mister A were even given small pieces of slate to take away as a memento. We had the perfect weekend away and would highly recommend a visit to Snowdonia. 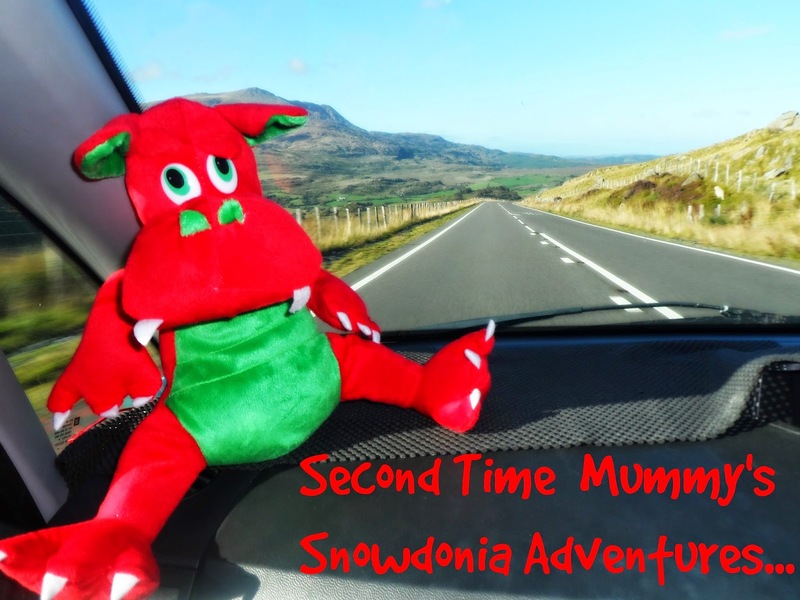 To find out more about the huge amount of attractions that Snowdonia has to offer then visit www.attractionsofsnowdonia.com - go on - do it now!! In exchange for this review we received a Deri cuddly toy, complimentary admission to the attractions reviewed and an overnight hotel stay.